What is Resco Pro-Series Combo Brush? The Resco Pro-Series Combo Brush combines two grooming brushes in one. One end contains stainless steel pins that work through the coat to remove tangles and loose hair. The other end contains nylon bristles to smooth the coat. The Resco Pro-Series Combo Brush combines the benefits of two brushes into one. Together both sides work to remove tangles and soften the coat. 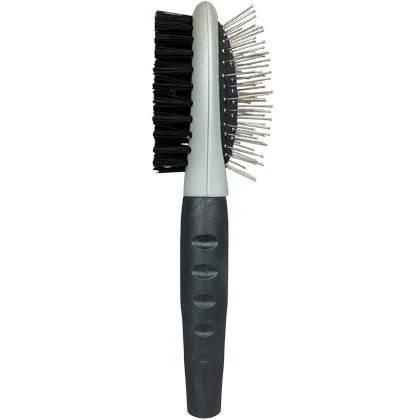 Resco Pro-Series Combo Brush is a dual purpose grooming brush. The Resco Pro-Series Combo Brush can also be used on cats. Consider using a moisturizing shampoo to help restore your pet's shiny and soft coat. Before grooming, make sure your pet's coat is completely dry. Brush as often as needed to remove loose hair or to soften your pet's coat.